Swedish consumer electronics company Elgiganten is commencing road trials of Volvo trucks powered by Liquefied Biogas (LBG). 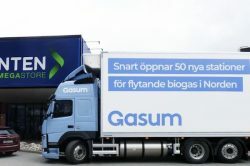 Using gas supplied by Nordic energy company Gasum and vehicles from Volvo Lastvagnar AB (Volvo Trucks), Elgiganten’s transport partners will run the outgoing transport from their Nordic distribution centre in Jönköping. On the procurement of Elgiganten’s new transport agreement in spring 2020, there will be requirements for parts of the vehicle fleet to run on fossil-free fuels, of which liquefied biogas is an option. A contributing factor is Gasum’s investment in a Nordic network of stations for gas, with a total of 50 stations up to and including 2020, of which one will be located in Torsvik close to Elgiganten’s Nordic distribution centre. “We are happy that companies like Elgiganten are taking the lead on sustainable transport. With liquefied gas, there is great potential to reduce the emissions within the transport sector,” says Mikael Antonsson, Country Manager Traffic at Gasum. “Testing biogas for transport is important for us in order to take the next step to reduce emissions of long-distance transport and contribute to reaching the EU targets for 2030,” says Niclas Eriksson, MD at Elgiganten. Biogas is produced from organic waste, and in the production process organic fertiliser is also formed, which contributes to a circular economy. Using biogas instead of fossil diesel reduces emissions of particulates and CO2. Volvo’s gas-fuelled vehicles can run on 100% liquefied biogas, which gives completely fossil-free transport. The hope is that the 70–100 vehicles that depart from the distribution centre in Jönköping every 24 hours to more than 250 destinations will show the partners that are taking part in the testing that gas-fuelled vehicles reduce both the fuel costs and the emissions without any negative effect on performance. The collaboration is closely linked to the opening of Gasum’s first filling station for heavy-duty vehicles in Västerås. From May, Gasum will open new stations every month up to and including 2020. There should then be a total of 50 new stations in the Nordic countries. “Every week we talk to logistics buyers and transport companies that want their logistics be more environmentally friendly at the same time as they want to lower their fuel costs. Liquified gas meets these requirements; so now that availability is increasing quickly with the new filling stations, so will demand,” Mikael continues. Gasum continues to strengthen the position and infrastructure of LNG and supplies LNG to maritime transport, industry and heavy-duty vehicles in Finland, Sweden and Norway.